Decoration Industry and Event planning in India are known to be quite a prolific one. There could be a million options for decorating an event, but it takes the right event planner, decorator to plan and design the best. Poojan décor is one of them. They are known in the event industry for redefining the décor-styles for events by providing their clients the best of everything. Throwing some more light on this creative segment, eventaa.com (a global business networking platform that connects diversified professionals from the event industry) would like to take you through “The Journey of Poojan Décor” as an inspiration for the aspiring and established decorators and event planners in the event industry across the globe. Poojan Décor is based in Ahmedabad since its inception in 1991. Over the past 25 years, Poojan Décor has built a reputation throughout, which reflects their expertise in providing client’s décor related services ranging from the destination, theme-based and customized weddings to corporate events. Pintoo Dandwala joined Poojan Décor in its early stage. With his belief in customer satisfaction and innovative décor solutions, he has brought the most talented designers together to bring out the most unique and extraordinary dreamy décor concepts. Mr. Pintoo Dandwala, Director of Poojan Décor Pvt. 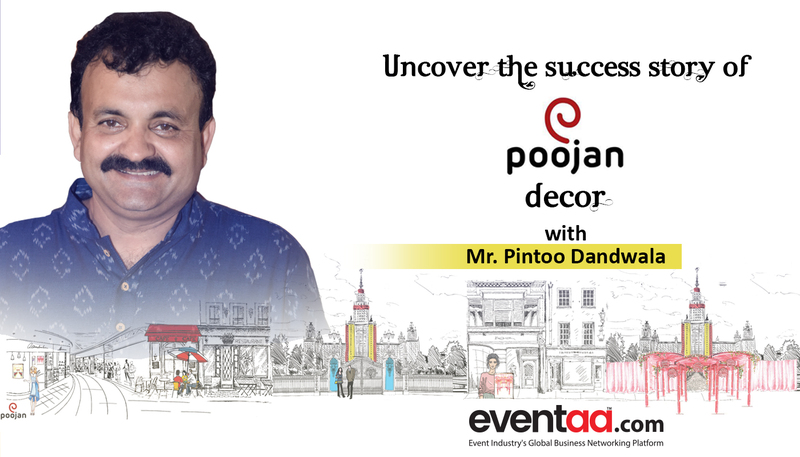 Ltd. walked us through the journey of Poojan Décor during his interview with eventaa.com. Eventaa: What motivated you to join the decoration business? Eventaa: What are the services provided by Poojan décor? Pintoo Dandwala: Poojan décor is into weddings, pre-wedding, product launch, corporate events, baby birth celebrations, birthday parties, concerts, public events etc. Eventaa: What was the most challenging project you have carried out until today? Pintoo Dandwala: There is a lot of hard work that goes into the process of organizing an event. The efforts payback only when our clients are happy with what we have provided. I remember when we were doing our ONGC project in Bharuch, that was one of the most challenging projects we have carried out. At 5 pm, we all were ready for the event, which had more than 20,000 thousand people and at 5:30 pm cyclone occurred. In spite of all that, the client wanted us to organize the event. We organized the entire event within 2 hours along with the ONGC team. Eventaa: Have you worked on any projects at International level? Eventaa: Which moment was the turning point for Poojan Décor? Pintoo Dandwala: I always believed in achieving new heights and give the best in every single step for this business. The turning point for Poojan Décor was the Thailand project. It was my dream to do an international wedding. Even after the fact that we incurred a huge loss, I organized this international wedding. Eventaa: What struggles did you face during the Thailand project? Pintoo Dandwala : I have faced so many struggles during the Thailand project. We had to get paperwork done, Many of us were jailed and deported back to India. It was our first international project. It has been challenging to establish and provide a base to poojan décor. Eventaa: Which was the best project you have carried out to date? Pintoo Dandwala: I can’t say which was the best at every event we have ever organized is the best for me due to the amount of time and hard work that went into it. Eventaa: According to you, which trends would 2018 see in the decoration business? Pintoo Dandwala: Whether it’s 2018 or 2028 florals will always be in trends. It is evergreen. But now a days few people ask for movie based decorations like Devdas, Padmavat or Baahubali. Good furniture is always in demand. Eventaa: What technologies have you used for various decorations? Eventaa: Out of 5, how do you rate your company in the decoration industry? Pintoo Dandwala: I never rate our company. I believe the real people who judge our work are our clients. We believe in customer satisfaction. Poojan Décor is operated by passionate employees who love their work and contribute their 100% to produce the best events ambiance. The team, rather the small family of ours is a unity of skilled craftspeople and technicians, responsible for creating artistic ambiance for various special occasions. It’s their skills that they put together to use, to provide guaranteed customer satisfaction. Eventaa: What is your success mantra? Pintoo Dandwala: “Never Say No! I always ask my team to say YES in front of the client, if they say anything don’t tell them NO. Our main objective is to make them happy and give them experiences worth remembering. Eventaa: What insights would you like to give to the budding decorators and event planners that see you as an inspiration? Pintoo Dandwala: Practical knowledge is the main key to this business. I always teach them not to rely on bookish knowledge. Motivate others and try to get the best out of it. Poojan Décor believes in making events grand, magnificent and charming by providing their clients with the most artistic ideas and give them the best experiences to cherish for a lifetime. As Mr. Dandwala rightly said “No matter what the year is, the floral decoration will always be in demand by implementing fresh ideas”. The floral trend forecast for 2018 pinpoints the same. To check out, the latest trend in floral décor click the link below. We value your inputs! Feel free to post your comments below! Check out the eventaa profile of Poojan Decor here.